Christian pilgrims who flock to the Jordan River to immerse themselves in the water where Jesus was baptized may have nothing left to dunk in next year. A team of Israeli, Jordanian and Palestinian environmental scientists says large stretches of the biblical river could dry up by 2011. And much of what remains is nothing but a canal of sewage, they said in a report released Monday. "You can almost jump across this river. In other places, you don't need to even jump — you can just cross it. It's ankle deep," said Gidon Bromberg, Israeli director of Friends of the Earth Middle East, the organization that commissioned the report. "You struggle to see the water." 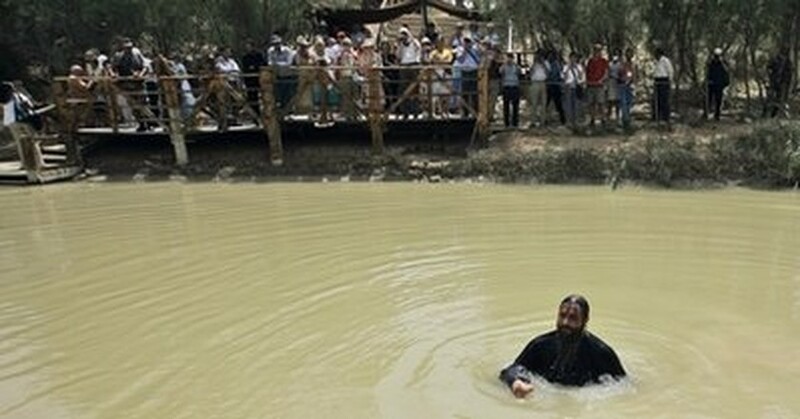 In this Tuesday, April 22, 2008 file photo, a Greek Orthodox priest bathes in the Jordan River after it was blessed during a baptism ceremony at Qasr-el Yahud near Jericho, in the West Bank. Sadly, it is one of the efforts to save the river that has helped doom it, the report said. Israel and Jordan have agreed to stop dumping waste into the river and instead treat it in plants expected to be up and running in both countries in 2011. But if no wastewater enters the lower Jordan — the river's largest section — then no water will flow in it at all, the report notes. According to Christian tradition, John baptized Jesus in the Jordan River. Typical of the region's conflicting land claims, both Jordan and Israel maintain the New Testament baptismal site stands on their soil, and the sites face each other on either side of the Jordan. On the Israeli-controlled side in the West Bank, the site is called Qasr al-Yahud, Arabic for "Castle of the Jews" or "Crossing of the Jews." In Jordan, it is called al-Maghtas, or "Baptism Site." The Bible describes the river, which flows south from the Sea of Galilee into the Dead Sea, marking the border shared by Israel, Jordan and the West Bank, as "overflowing." In 1847, a U.S. Naval officer visiting the area reported on the "deafening roar of the tumultuous waters." But over the past five decades, Israel, Jordan and Syria have diverted about 98 percent of the Jordan River and its tributaries for drinking water and agricultural use. Only 700 million to about 1 billion cubic feet (20 million to 30 million cubic meters) flow through the river today, a tiny fraction of the 45 billion cubic feet (1.3 billion cubic meters) that used to surge through before the 1930s, when the first dam was built on the river in what is now Israel. What was once the narrowest stretch of the river has now become its widest. In some spots, the Jordan is only a trickle. Otters and other creatures that used to live on its banks are long gone. Today, the lower section of the Jordan is choked with sewage from towns on the Israeli, West Bank and Jordanian sides. The report's authors praised the Israeli and Jordanian wastewater treatment plan, while noting that it will dry up large stretches of the river by the end of next year because the treated sewage will be used for agriculture rather than being pumped into the Jordan. The report recommends that Israel and Jordan rehabilitate the river by filling it with freshwater pumped in from the Sea of Galilee and the Yarmouk river, the Jordan's largest tributary, in addition to highly treated wastewater, to return a third of the volume that once flowed there. Today, most Christian pilgrims who visit Israel immerse themselves in the fresh waters of the Jordan river at Yardenit, a modern-day baptismal tourist site near the Sea of Galilee, 60 miles (100 kilometers) upstream. Less than a mile (about one kilometer) away, a dam built by Israel blocks the water for agricultural use. Steps away, a fountain of murky sewage from nearby Israeli communities shoot through a rusty pipe, where it joins up with agricultural runoff and saline water from nearby salt springs to form the rest of the river. Some still go to the traditional baptism site of Jesus. On Sunday, a grinning Christian pilgrim from Moscow donned a long white robe and bobbed up and down in the brown waters, gesturing the sign of the cross with his hand each time he came up for air. Some environmentalists strongly discourage baptisms there because the foul state of the waters make it a health hazard. On the Israeli-controlled side, the site is closed most of the year because of its location in a military zone, surrounded by minefields, on the international border with Jordan. About 30,000 pilgrims were allowed to visit this year, according to the Israel Nature and Parks Authority, and Israel is now renovating the site to accommodate more tourists. The sad state of the Jordan River does not exist in a vacuum. Political deadlock between governments sharing the river and its tributaries has exacerbated the water shortage. Israel and neighboring Arab countries have complained about each other's projects to divert shared water sources for their own needs. The diversion of waters from the Jordan is also a major reason why the Dead Sea is shrinking so dramatically. The legendary salt-water lake has lost one-third of its volume since Israel and Jordan built plants in the 1960s to divert the waters of the Jordan.